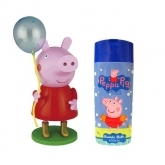 Peppa Pig is a British preschool animated television series created, directed and produced by Astley Barker Davies, which originally aired on 6 May 2004, and is distributed byE1 Kids. To date, four seasons have been aired. It went on a hiatus for 2 years and 2 months before re-premiering on 14 February 2015. It is shown in 180 territories. This animated series nowadays has a entire line of products, including fragrances for children.